Mnemonics are memory aides that help us remember information. Our society is acronym-happy; there’s an acronym (a word formed by taking the first letter in a name or phrase) for almost everything, from ATM (automated teller machine) to ZEV (zero emission vehicle). Most of the acronyms we know are professional jargon, but I wanted to take a look at some of the mnemonics that can help us practice better health, wellness, and safety. 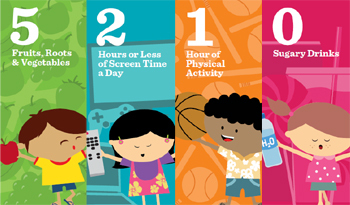 2 hours of screen time or less of computer, video, and TV screen time. Red: Very heart healthy and gives strength support to our joints! Apples, strawberries, and tomatoes. Orange: A great source of Vitamin C. The orange group helps keep our eyes healthy! Oranges, carrots. Yellow: This group is good for our skin and helps our digestive system! Bananas, corn, and lemons. Green: Helps our entire body and strengthens our immune systems which means fewer colds! Asparagus, broccoli, and spinach. Purple: Purple/blue foods are excellent for our brains! They help us with our memory and also help keep some cancers away! Blueberries, grapes, and plums. Remember “Stop, drop, and roll!” if your clothes catch on fire. Slip! on a shirt. Protect your skin with clothing. Slop! on sunscreen. Use a sunscreen with a sun protection factor (SPF) of 15 or higher. Slap! on a hat. Wear a hat with a wide brim to protect your ears, neck, and face. Wrap! on sunglasses. Protect your eyes and the skin around them. When the face is RED, raise the HEAD. When the face is PALE, raise the TAIL. Face drooping. Smile – does one side of the face droop? Arm weakness. Raise both arms – does one arm drift downward? Speech difficulty. Repeat a simple phrase – is speech slurred or strange? Time to call 911. If you observe any of these signs, call 9-1-1 immediately! Are there rhymes or acronyms to help you in an emergency? How do you remember to keep well? If spring is for cleaning out your home, summer is a great time to take another look at the outside of your home. You don’t have to do anything fancy or spend a lot of money to add curb appeal. I’m not much of a gardener. I don’t like weeds, I’m afraid of bugs, and plants don’t really like me. Our landscaping is simple and easy to maintain, but we’re working on making it better. And I wanted to share some simple, inexpensive ideas with you. Consider landscaping with Native Hawaiian plants, many of which are endangered. Native Hawaiian plants have adapted to Hawaii’s climate and are drought-tolerant — they can flourish with less water than imported plants. There are two excellent articles by the University of Hawaii at Manoa’s College of Tropical Agriculture: “Best Native Plants for Landscaping” by Melvin Wong; and “Native Hawaiian Plants for Landscaping, Conservation, and Preservation” by Heidi L. Bornhorst and and Fred D. Rauch, about growing Native Hawaiian groundcovers, shrubs, and trees. In Honolulu and Waimanalo, Geobunga offers free outdoor design workshops for do-it-yourselfers about orchids, water lilies, water features, bamboo accents, rock gardens, container gardening, and more. 1. Choose new house numbers. It’s amazing what new house numbers can do! Select house numbers that match the style of your house, paying attention to style, size, and finish; or go bold with a custom plaque. 2. Upgrade your mailbox. If you have a mailbox by the side of the road or mounted to your house, you can upgrade your curb appeal with a new, larger mailbox. Make sure that you follow the US Postal Service’s mailbox guidelines. 3. Paint your front door. All it takes to add brightness and revive your house is a gallon or two of exterior paint or stain. You can also refresh the paint on door and window trims, shutters, and planter boxes. 4. Install new door hardware. You can change the whole look of your front door by choosing a new doorknob or handle that matches the style and finish of your house. Changing the lockset is a little more costly and time-consuming, especially if you want to add a deadbolt, but security is important. 5. Clean your windows. Sometimes, just cleaning your windows inside and out can improve your view. Here’s a tip: wash your windows on cloudy, calm days; sunny, breezy days can dry windows too quickly and leave streaks. 7. Tidy up your front yard. Trim overgrown hedges, edge walkways, pull up weeds, and cut out dead growth. If your landscaping is a little sparse, create interest and dimension in your front yard with low, medium, and tall plants. Remember: if you’re part of a community association, you may need to get approval before making any changes to the exterior of your house or townhouse. When you first see a home, what grabs your attention? How does your curb appeal compare to your neighbors’? The essays were included in “The Price of Paradise: Lucky We Live Hawaii?” (1992), a collection of 38 short essays discussing Hawaii’s underlying problems and challenges, edited by law professor and author Randall W. Roth. These questions are as relevant today as they were over 20 years ago. I am a strong proponent of repealing Hawaii’s GET and replacing it with a reasonable sales tax. I’ve contacted our legislators, but this doesn’t seem to be a priority or controversy with anyone, not even taxpayers. Fox offered 5 arguments in support of the GET, concluding that “Even with its flaws, Hawaii’s excise tax is a good tax, in need of nothing more than fine-tuning” (page 109). 1. The GET has a broad base. It taxes business income, whether wholesale or retail. 2. The GET has a low rate. It can raise more revenue from a relatively modest tax rate. 3. The GET is fair. People with the same level of consumption pay the same tax. 4. The GET exports the tax burden. About 30% of the GET is paid by non-residents. 5. GET tax credits offset the burden of the tax, targeted only to residents and the poor. 1. A sales tax would have a broad base. It would tax all retail sales in Hawaii. And it would simplify paperwork and record-keeping, as producers, wholesalers, distributors, and value-added resellers would not be forced to act as tax collectors. 2. A sales tax could have a low rate. We could still have a relatively modest tax rate. 3. 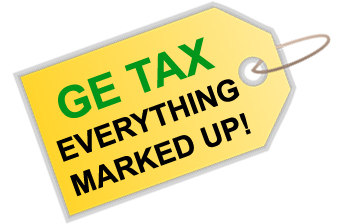 A sales tax would be even more fair than the GET. It would remove the unfair pyramid taxation at every level of production, from wholesale to retail. It would also remove the unfair double taxation of paying a tax on the GE tax we already pay (that extra .212% of the 4.71% we pay on Oahu and that extra .166% of the 4.166% we pay on the neighbor islands). 4. A sales tax would export the tax burden. A sales tax would still be paid by non-residents. 5. Sales tax credits could offset the burden of the tax, if the credits are targeted only to residents and the poor. * A sales tax would save taxpayers money. For example, if you bought a $30,000 car on Oahu, you would pay $1,413 with the 4.712% GET or $1,350 with a 4.5% sales tax. That’s $63 that you shouldn’t have to pay. * A sales tax would reduce business tax payments. Businesses already pay corporate income taxes, either directly or by passing it on to owners, partners, and shareholders. It doesn’t make sense to tax business income twice. * A sales tax would give us more accurate reporting of business activity in Hawaii. Business activity is inflated, because it includes the tax that is paid on a portion of the GET. Is Hawaii’s general excise tax fair? Can we continue to afford the GET? What do you think? In his part memoir, part novel “SPAM Cans, Rice Balls and Pearls: Snippets of Memory from World War II” (2002), Bruce Muench admits that SPAM was a “delicacy” and that he empty SPAM cans to collect shells, turning them into tombs for sea creatures. Poetic and a little creepy. But it made me think about all of the empty SPAM cans in our house, which I dutifully rinse and dry and keep in bag waiting to… recycle them? use them again? turn them into a SPAM tower? In April, Honolulu celebrated its 11th Annual Waikiki Spam Jam, a street festival that celebrates all things SPAM. That’s how much we love SPAM, ever since it was introduced to Hawaii during World War II and adopted into our local culture. Hawaii buys 7 million cans of SPAM each year! Remember that the inside of the can has a sharp edge! You can use straight-edge pliers to pinch the edges down and sand down the edges with sandpaper. * Make SPAM can planters and organizers. 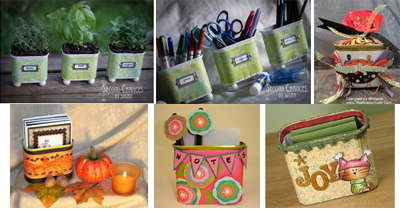 On the Second Chances by Susan blog, she used SPAM cans to hold everything from plants to office supplies. She spray-painted the can, covered it with decorative paper, added embellishments, glued small bookplates as labels, and added 4 20mm wood beads on the bottom. * Make SPAM can candy gifts. Michelle on the Random Crafting blog used plain white paper to decorate a SPAM can with stamps, scrap paper, and tags. She filled it with Halloween candy, but you use it for any special occasion. * Make SPAM can paper-and-pen sets. Joy, the host of the Joy of Crafting Show, used scrap paper to decorate a SPAM can into a cheerful paper and pen set (with coordinating pens). * Make SPAM can notecard holders. IndyCut on the SplitcoastStampers blog used black paper, borders, and ribbon to make a notecard holder filled with custom notecards for Halloween. Jenn Muraoka of KiyomiKrafts.com made a cute notecard holder using scrapbook paper, ribbon, and embellishments, and added matching 3”x3” cards that fit in the can. * Make SPAM can candles. Yahoo! Contributor Emma Salkill melted wax (or crayons) in a glass cup and added a scent. She poured the melted wax into a SPAM can (with the label or covered in decorative paper), used a pencil to hold up the wick, and allowed the wax to set before removing the pencil. What do you do with your empty SPAM cans? How can we re-use and re-purpose SPAM cans? Over 60 years ago, an American man from Illinois and an Uwajima man from Japan met and found common ground at the end of World War II. It led to a friendship free of prejudice, fear, or bitterness. 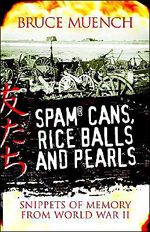 Their story is told in “SPAM Cans, Rice Balls and Pearls: Snippets of Memory from World War II” (2002) by Bruce Muench, a book that is part memoir and part novel, “a story of two young men from opposite sides of the Pacific, how they happened to meet and what they said to each other” (page viii). Bruce Muench was born in Des Plains, Illinois. He joined the navy in 1944 at age 17, and was a radioman aboard the Shipley Bay before being stationed at Kwajelein, an atoll in the Marshall Islands in the Pacific. Muench “resented authority that wasn’t tempered with humor” (page 76), and some of his insubordination landed him with guard duty. Akio Yamazaki was born in Uwajima, Japan, spent two years at the University of California at Berkeley, and was a radio intercept interpreter stationed on the Island of Moen in Truk. Like his father Tomasu, he was a Christian in a country that is mainly Shino and Buddhist; his uncle Sadatake was a commercial fisherman and cultured pearl entrepreneur. He was an interpreter during the Japanese war trials. They met in 1945 for a few days in Kwajelein. They were not soldiers in combat, their lives were not in danger (except perhaps, in Muench’s case, from boredom), and they were far from home, but they made the choice to reach out to each other. They shared their stories and experiences about nature, family, and food. They continued their friendship until 1959, then lost touch with each other, and reconnected again in 1983. Muench reflects upon different attitudes towards individual life – in American culture survival was paramount, but in Japanese culture capture was a disgrace. He makes an interesting observation about individual freedom and the role of government: “Both fishermen and farmers tended to be independent in their behavior. Their lives depend upon the whims of nature rather than upon any government” (page 120). And he has an unexpected proposal for future wars: “If it were up to me, I would propose an international law that all future wars must be fought by people over 65 years of age, like myself. That way war could become much more subdued and not many people would be killed, because of the frequent breaks to go to the bathroom and to the drug store” (page 152). What about the SPAM cans, rice balls and pearls? Muench considered SPAM “a delicacy” and used empty SPAM cans to collect shells, turning them into tombs for sea creatures. The rice balls symbolize nourishment through prayer. And the pearls are another symbol of common ground, a Japanese doctor (Yamazaki’s father) and Mississippi fishermen talking excited about the business of harvesting pearls and button-making. You are currently browsing the Better Hawaii weblog archives for June 2013.